Clotilde Dusoulier, a native Parisian and passionate explorer of the city’s food scene, has won a tremendous following online with her insider reports and wonderful recipes on her blog, www.chocolateandzucchini.com. Her book, Chocolate and Zucchini, introduced her to a wider, equally enthusiastic audience. Now in Clotilde’s Edible Adventures in Paris, Clotilde reveals her all-time favorite food experiences in her native city. She takes us on a mouthwatering tour of the restaurants, markets, and shops she loves the most: from the best places to go for lunch, tea, or a glass of wine, to “neo bistros” and the newest places to find spectacular yet affordable meals. Packed with advice on everything from deciphering a French menu to ordering coffee correctly, this book is like having Clotilde as a personal guide. A dozen tempting recipes are also included, shared or inspired by Clotilde’s favorite chefs and bakers. 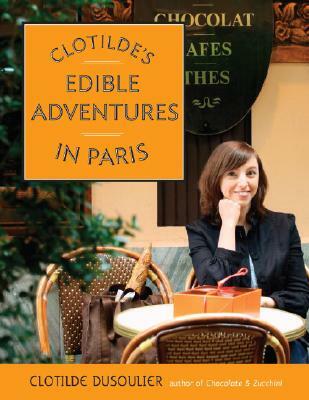 For first-time visitors and seasoned travelers alike, Clotilde’s Edible Adventures in Paris offers invaluable insider recommendations on eating and shopping with Parisian panache. The best of Paris, featuring 164 restaurants, bistros, wine bars, and salons de thé, as well as over 130 bakeries, pastry shops, cheese shops, bookstores, chocolate and candy shops, cookware and tableware stores, specialty shops, outdoor markets, and much, much more! CLOTILDE DUSOULIER is the author of Chocolate & Zucchini and writes the popular blog chocolateandzucchini.com, from her Paris apartment.